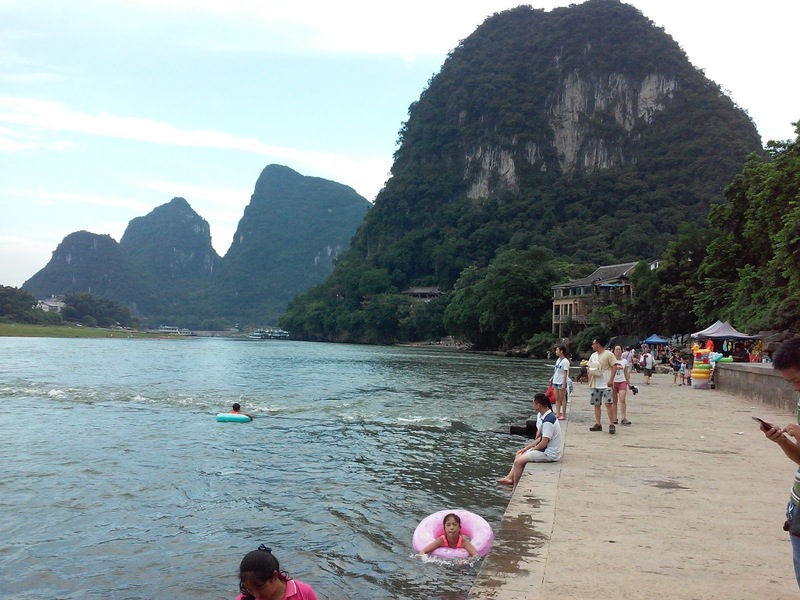 This post is written by Katie, about her solo trip to Guilin and Yangshuo. We woke at 3:35am to catch our 4am taxi that we arranged the night before through Beijing Drum Tower Youth Hostel for ¥180. That is probably much higher than the meter would have been, but we were worried about whether we would be able to find a taxi on the street so early in the morning. The hostel had claimed that the taxi ride would take an hour, but in reality it took only 21 minutes. When we got to the Air China check-in counters for my flight, the lines were huge as the counters apparently did not open until 5am. As seems to be a common occurrence, a few Chinese completely ignored the line and pushed their way in at the front. It is insanely frustrating. Check-in was very efficient and quick once we got to the front of the line though. Then it was time to say goodbye, as JT is returning home through a 48 hour around the world trip while I am heading to Guilin, Yangshuo, and Hong Kong before heading home in 5 days. China really seems to care about carry-on battery packs – they examined mine thoroughly before letting me pass through security. Comically, I was one of the last people to board, but since it was a bus-to-plane departure (surprise! We were at a gate with a Air China plane sitting at it, but it was not ours apparently) I entered the bus last and exited first. Hence, I was one of the first to board the plane. The plane (B-6823) was very peaceful before anyone boarded, but as people boarded it got very loud. As seems to be common, the people around me seemed to be trading seats initially and also during the flight. If you check-in online you can pick your seats – why did these people not do this? The seats were comfortable, and the flight nice. The in-flight breakfast provided a choice of ‘western’ or ‘Chinese’. I guiltily went with ‘western’ but was really glad when she saw what each was. ‘Western’ was scrambled eggs, hash browns, fruit, and a croissant whereas ‘Chinese’ was a weird grainy oatmeal, a corn(?) muffin, and fruit. One of the Chinese people in my row switched to ‘western’ once he saw both choices. 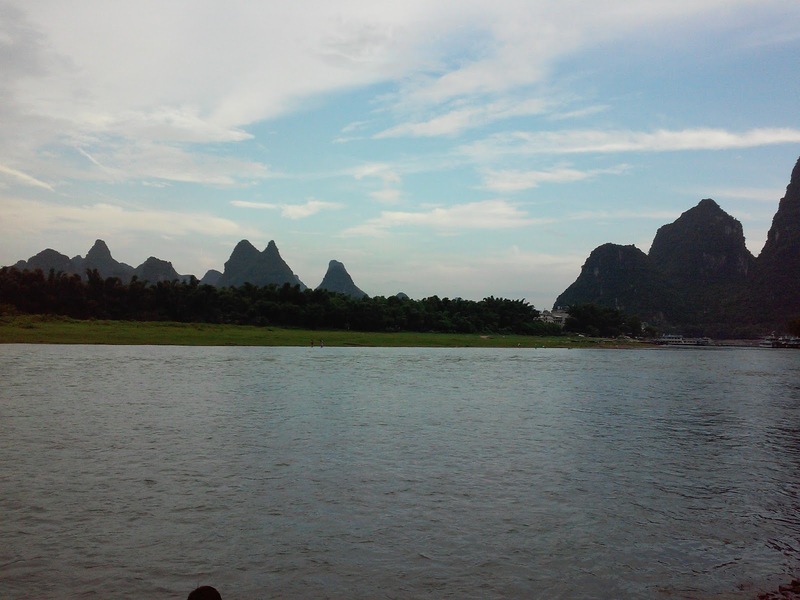 Once in Guilin, I bought a ¥50 ticket on the 11:30am bus from the airport to Yangshuo. This meant an hour and a half wait, but the waiting room was comfortable enough. The 11:30am bus to Yangshuo left right on time. It was a large tour bus, with room for large luggage below the bus and small bags on the racks above the seats. 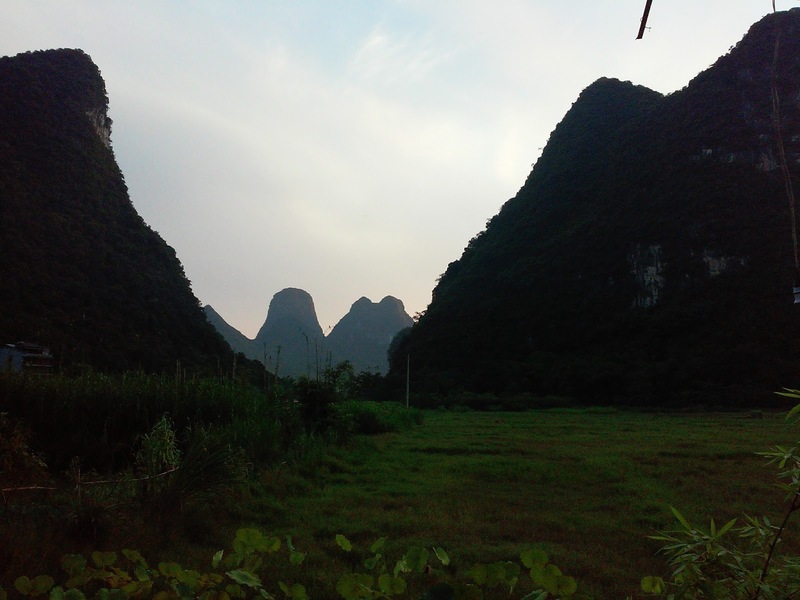 It was about 1/3 full on my trip and made no stops until exiting the highway at the Yangshuo exit. I exited the bus before the bus station, since I saw on google maps that an earlier stop was closer to Huanggong Garden Hotel. But after exiting, I realized there were no taxis or rickshaws. I knew from Google maps that the walk was only 3.5 km (which seems a lot shorter than 2.2 miles!). The only bad thing about the walk was that there was no sidewalk or shoulder for most of the walk. But otherwise, it was not so bad. The pin for Huanggong Garden Hotel on Google maps was not in the right place, so I walked too far before asking some locals, who easily pointed me in the right direction. A dog on the final road approached me and snarled, and I did exactly the wrong thing – act afraid. But the dog luckily ran away anyway. 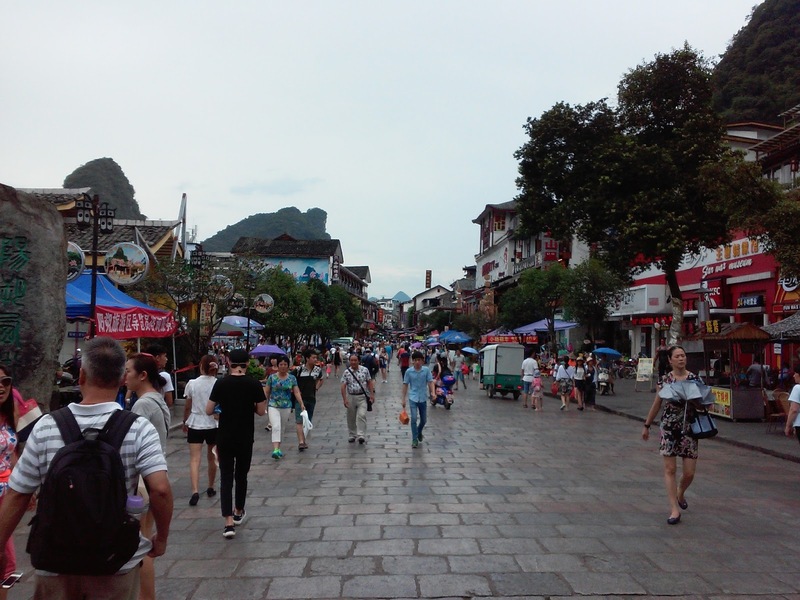 Yangshuo certainly has a number of dogs on the street acting aggressive – it is rather concerning. Once at Huanggong Garden Hotel, which is more more like a guest house, my entrance woke up a sleeping Chinese man who spoke no English. I was starting to get a bad feeling about the whole thing until the Chinese man called someone and gave me the phone. The owner was on the phone – and it was a terrible connection – but I understood that this was the owner’s brother, the owner would be back tonight, and I had a 5th floor room. The phone dropped, but the brother showed me my room and gave me a key. I settled in and waited for some rain showers to stop before undertaking the 40 minute walk to West Street (and its Western counterpart, Guihua Street). Once there, I hunted for Bike Asia since they were reported to run good bike tours and have good rentals. But disappointment all around – rentals are by the day (not by 24 hours), no one is signed up for tomorrow (I left my phone number so they can text if someone becomes interested), and the day after just has a private tour. However, if I rent a bike they will give me a map and lock and explain a good route, so I might do that. Then I noticed a Rough Guide recommended restaurant Lucy’s Place right down the street so I stopped in and ordered a large local beer (¥12) and a bacon, tomato, lettuce, cucumber, and cheese sandwich with french fries (¥25). They were both good, and I will likely return if I am hungry and in that area again. 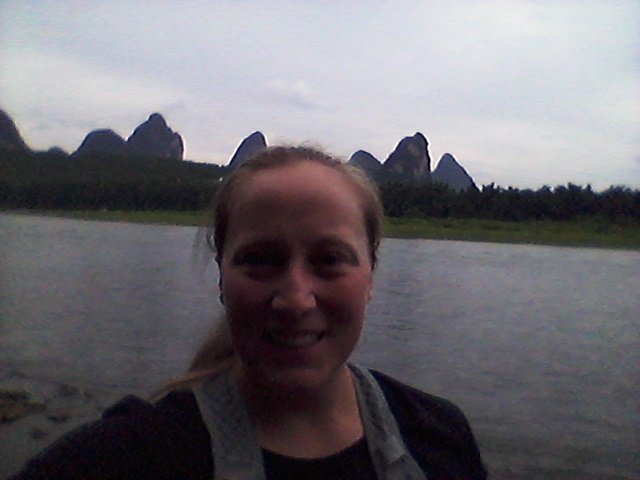 After eating I wandered down to look at the Li River before making the trek back to the hotel. I stopped at a grocery for beer (¥3) and vitamin water (¥4), and they tried to pull the trick where something is already rung up. When the cashier reported my bill was ¥22, I looked at the screen and pointed out that I only had two items, not three. She laughed it off and quickly removed it. I wonder how many tourists fall for that! I arrived back at Huanggong Garden Hotel at just the right time for pretty sunset views. I got some pictures, met the owner, chatted about my plans for tomorrow, set up laundry plans (self wash for free in morning), and ordered breakfast (8am, western, ¥35). Then I retreated to my room to work a little and then call it an early night. What an adventurer. Thanks for sharing and safe happy travels!